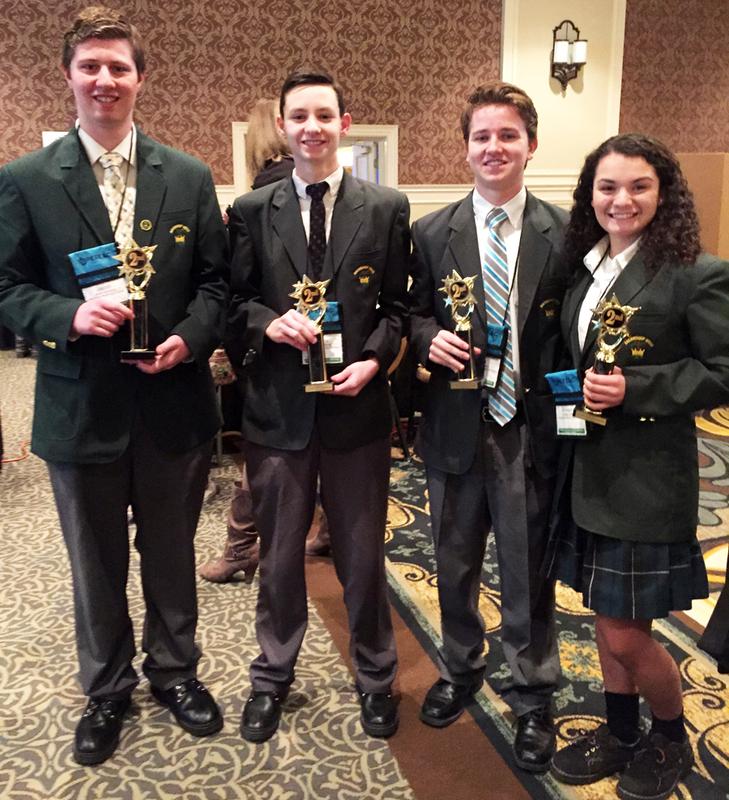 Archbishop Wood High School’s inventors, who captured second place at a recent statewide competition in Hershey, Pa., include students (from left) Jacob Leinenbach, Shane Kennedy, Greg McFadden and Arianna DiPalma. Call it High School Science Fair meets television’s Shark Tank. That was the competition a group of four Archbishop Wood High School engineering students entered last week carrying a remarkable invention of their own design and construction. They left the arena in Hershey, Pa., carrying home trophies and a second place finish out of 70 teams from around the state of Pennsylvania. They dubbed their invention the A.R.T. glove — Arthritis Relief Technology glove — designed to ease the sometimes excruciating hand pain experienced by arthritis sufferers. The competition was inspired by today’s emphasis on STEM (Science, Technology, Engineering and Technology) education. It was held as part of the fourth annual Pennsylvania Educational Technology Expo and Conference held in Hershey last week. And it carried a special twist. The students had to convince their audience that their glove wasn’t just innovative — it was worthy, theoretically at least, of capital investment. The competition was engineering and sales rolled into one. Working as a group in one of Wood’s STEM classes, Intro to Engineering, the four students – Jacob Leinenbach, Shane Kennedy, Greg McFadden and Arianna diPalma – and their classmates were given a broad assignment by teacher Kevin McLemore: Invent something that will help people with physical or mental disabilities. The students had three weeks to come up with an idea, research a solution and engineer and complete the glove itself. The four winners of the class competition made the glove from a special thin-fabric material that incorporates a series of 12-volt heating wires and a unique slip-in thermoplastic brace, providing arthritis sufferers significant relief during waking or sleeping hours. The two-and-a-half hour competition in Hershey required all student teams not only to demo their inventions for attendees, who were mostly teachers as well as some technology professionals, but also to pitch the projects’ benefits and sales potential. In fact the Wood team garnered $3,300 in investment capital from attendees. Alas, the capital was in the form of “play bucks” handed out to attendees before the competition. But play money or not, the amount “invested” in the Wood team resulted in their glove and their sales pitch being judged better than 68 other contending teams. In addition to individual trophies, each member of the team took home a $50 Amazon gift card. The Archbishop Wood community is basking in pride from the triumph of their four accomplished students.